Every time I buy a cookbook,I tell myself that it is my last cookbook purchase(for a while).There was a time when I HAD to buy a cookbook whenever someone mentioned nice things about it,glad that phase has come to an end.The last one I bought was Joy the Baker Cookbook and that was a while back. The irony is that,whenever I am itching to bake something new,I google and check out the first few entries or go through the good ol' BBC Good food site or King Arthur Flour.Which made me a bit philosophical and hence I decided to try at least one recipe from each book for a month whenever I feel like making something new. I'll start with A Passion for Baking.I got this book as part of a Giveaway and it has been with me for more than a year and I have so far only tried one recipe from it-blasphemous I say!I remember noting down this recipe to be tried immediately and wonder what kept me away from it for so long. 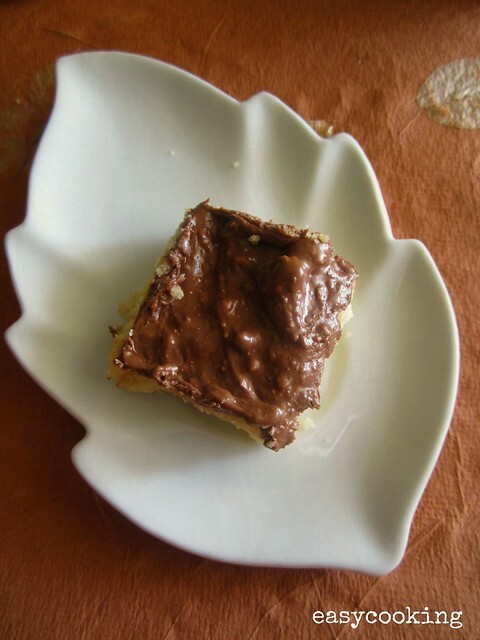 Candy bar shortbread is a very simple recipe but gives spectacular results.Buttery shortbread topped with melted Toblerone candy bars,can it get any better?Next time you feel like baking cookies,try this for a change.Works well as a party dessert too,served with some ice-cream on the side perhaps? Remove the chocolates from the fridge,let it come to room temperature and then chop roughly into small chunks. 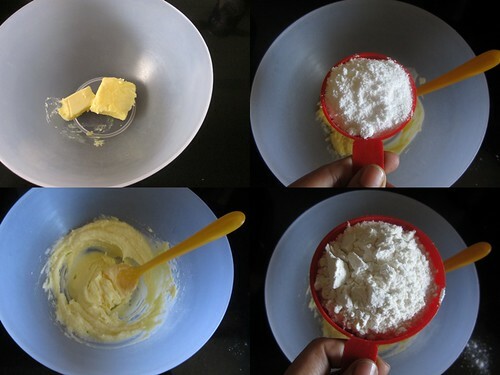 Beat together butter and sugar till creamy. Mix in the flour all at once and slowly start mixing.You will get a crumbly dough,just make sure all of the flour has been mixed in and no visible white specks remain. 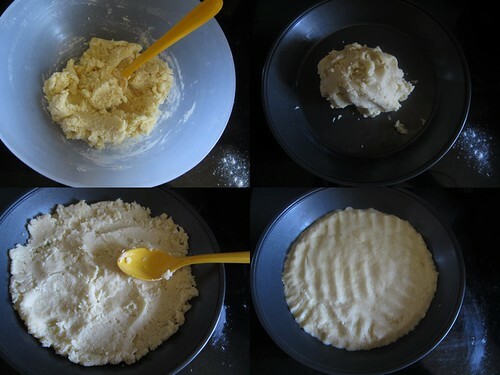 Pat the crumbly dough into a baking tin(I used a round tin)and level it using the back of a spoon. (or use you fingers to pat like I did). 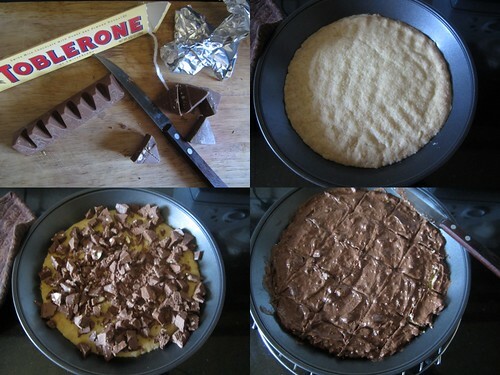 As soon as the shortbread is out of the oven,sprinkle chopped chocolate over the hot uncut shortbread. Let it set sbout 5 minutes and then smear it all over using the back of a spoon. 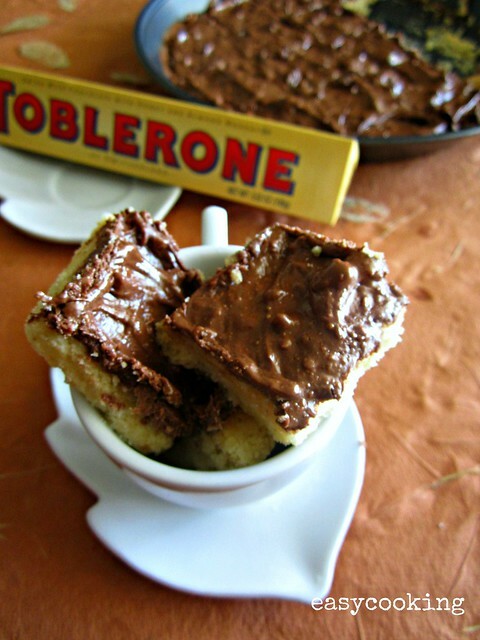 Mark into small squares and let the chocolate set in the fridge for 20-25 minutes.Remove from the tray and serve. The recipe calls for a pinch of salt,skip if you are using salted butter.I forgot to add the salt but the cookies tasted just fine. I pulsed the sugar in the mixer for 5 seconds till it resembled fine granules. Is that it? It's THIS simple? Shortbread looks so soft and yummy. Excellent shortbread, looks so yum n interestig!! wow!! divya its really tempting me!!! 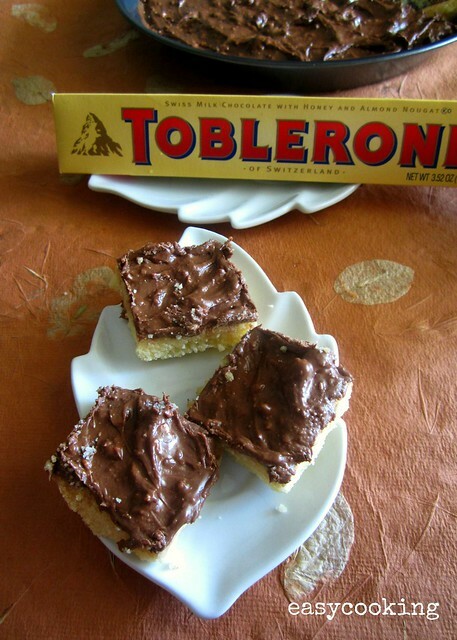 Seriously cant take my eyes from ur clicks, addictive shortbread. Wow! I never thought this recipe would be so easy! I tried it out today and it turned out yummylicious. The photo will be posted later in my Online Album on FB. Thanks! Writing in to tell you that i made this today for my little boy and he loved it. It was soo delicious. We enjoyed it. Wow how simpler can it become!..too good.. These are one of the first recipes I tried from the book too. I love this book, have tried quite a few from it.